Please join us for our 16th Annual IIDA New England Croquet Tournament, hosted at the International Tennis Hall of Fame in Newport, RI. This dynamic event highlights the competitive, yet friendly spirit of our local Design community and its myriad partners while funding the Providence City Center Student Scholarship. This year we will continue to host our expanded number of playing spots! Based on availability each time slot can accommodate 112 players. We are honored once again to be supporting Riverzedge Arts, a 501(c)3 located in Rhode Island. Riverzedge Arts’ mission is to improve lives and places through art, design, and creative problem solving. Gain visibility at the most demanding event of the New England Chapter! Click here to view the opportunities. Click here for details on event tickets. The Providence City Center is once again thrilled to offer a student scholarship. The deadline to apply is May 31. Please click here for more details! One Bill at a Time is a campaign to raise awareness and resources for Interior Design Advocacy in the New England Region. 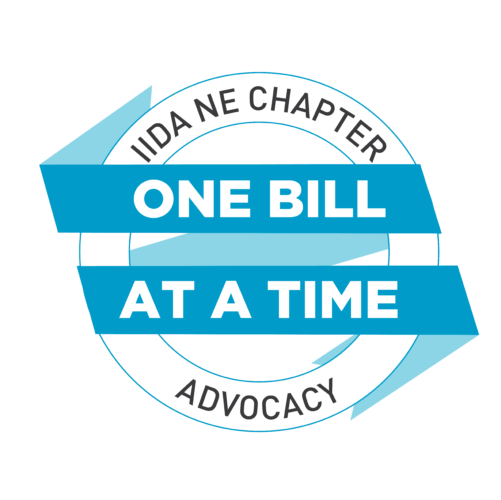 By adding two dollars to each event hosted by IIDA NE, we remind ourselves that advancing our profession is the core mission of our Organizations and, with small individual contributions throughout our community, we can make a large impact*. *At the conclusion of each calendar year, all funds raised will be distributed to New England states with active advocacy initiatives in direct proportion to the percent of Chapter membership residing in each state. We dedicate this campaign to the individuals that achieved interior design legislation in New England states and paved the way for the future of our profession, One Bill at a Time.